I seldom make lasagna. How seldom was brought home to me when I was washing out my food storage bins and discovered that my lasagna was past its expiration date. I had not realized pasta had an expiration date, so there you have it. That poor box of lasagna has been dragged through two moves and I still had not emptied it, so I decided to finish it off and actually make a pan of lasagna. Now, I didn’t happen to have ricotta or mozzarella on hand since I seldom buy specialty cheese as I don’t use them quickly enough and they spoil. So, I made do with substitutes that made a tasty but totally inauthentic lasagna. But let’s work through it. First I started water boiling. When it began a rolling boil I added eight pieces of lasagna pasta. I also added 3 pieces of Italian Sausage right out of the freezer. I figured why dirty two pans…and if anything the sausage might add some flavor to the pasta. I got out a rectangular baking dish that was about as wide as 2.5 pieces of lasagna and just a bit shorter than the pasta. I laid down three pieces of lasagna, the middle one overlapping the two outer pieces. I then thinly sliced one of the pieces of Italian sausage and laid it down over the pasta. Taking about 1/2 cup of cream cheese, I dotted cream cheese in the spaces between the sausage. I then layered finely chopped kale on top. I used one full stalk, removed the ribs, and then chopped the kale. Then I laid down two more strips of lasagna for another layer. I took the other two Italian sausages and removing the skins, I chopped them up in a bowl and added 1 14.5 oz can of chopped tomatoes with jalapeños. I would have used fresh but didn’t happen to have any on hand. I mixed the sausage and tomatoes together and layered them on the pasta. On top of that I added a layer of black beans from a can, thoroughly rinsed in cold water.On top of that I added some sour cream which made a nice bed for the next layer of kale – using one more more stalk of kale finely chopped. I added a final layer of pasta and baked until done in a 350° oven. When it was done, I sprinkled some parmesan and some pepper jack cheese on top and broiled for just a few minutes to brown the cheese. So, this made 12 servings which is why I don’t make lasagna very much. Luckily my friend came over and had some, too. It was delicious and easy to make and really did a good job of cleaning out some remnants in my fridge (cream cheese and sour cream). It was not too spicy, rich and flavorful. 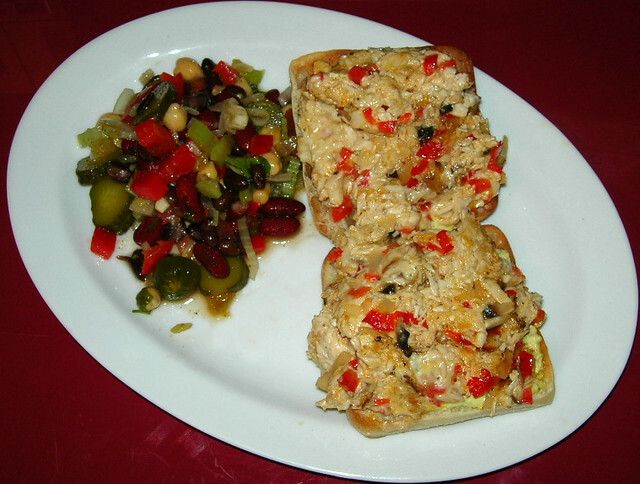 This is a variation on my Cuban Bean Salad. 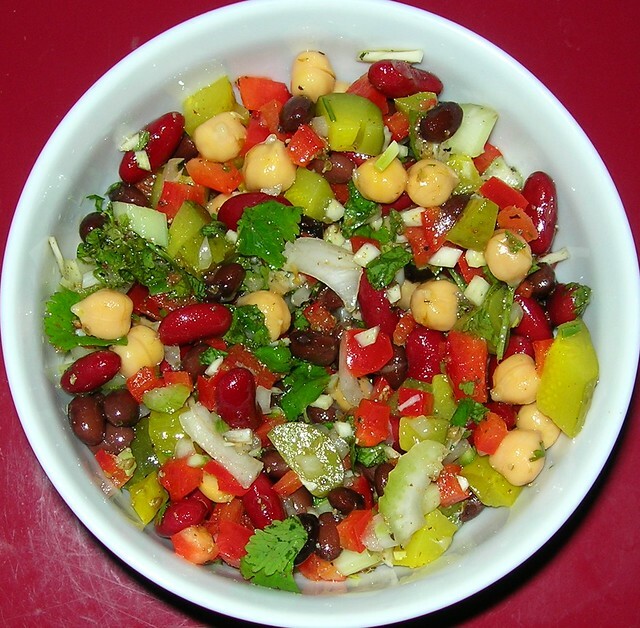 I decided to call it a Baja Bean salad because I used limes and red peppers instead of lemons and tomatoes. It’s fresh, delicious and full of protein. 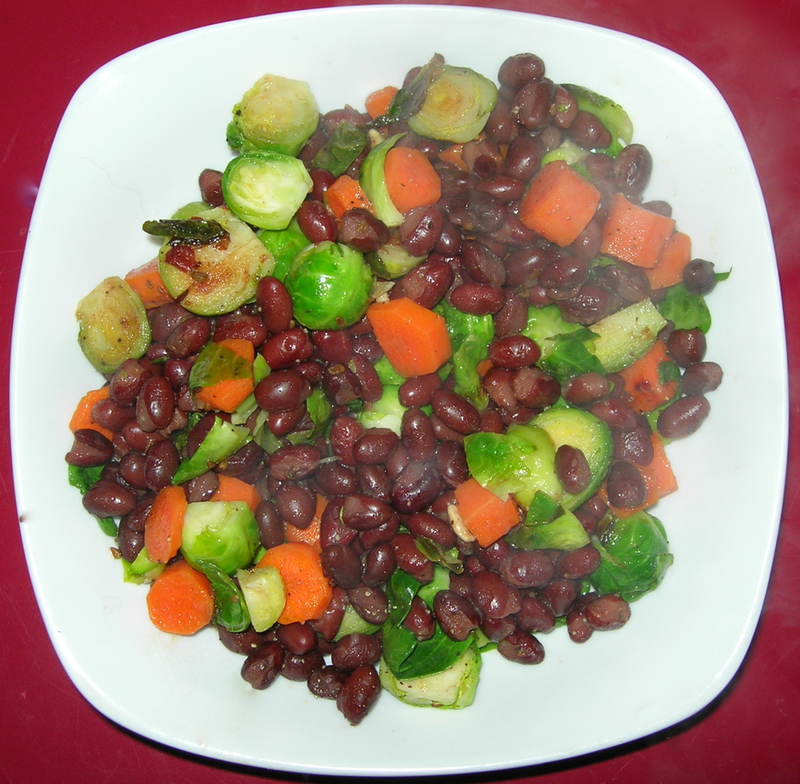 To start rinse and drain 1 can each of black beans, garbanzo beans and red kidney beans. Toss them in a large bowl. Clean and chop 3 stalks of celery, 2 red bell peppers and 8 baby dill pickles. Add and mix well. 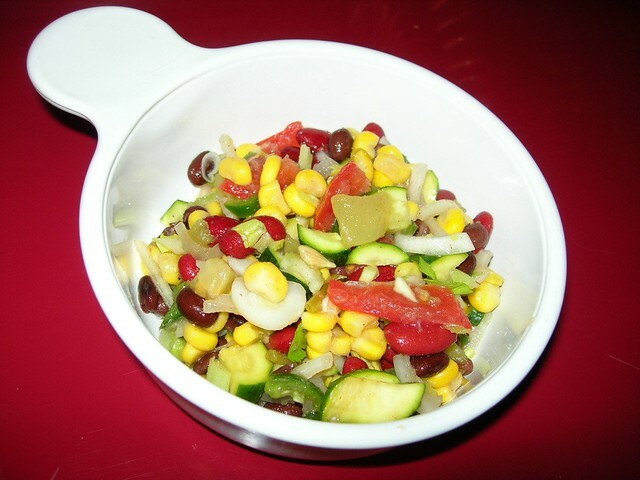 Set aside while you make the dressing in a separate bowl. Crush 3 garlic cloves, sprinkle with salt and let rest while you add the other ingredients to your dressing in a small mixing bowl. Clean and finely chop one serrano chili and put in the bowl with 3 TBSP of olive oil, 1 TBSP white vinegar, 2 tsp of cumin, 1 tsp of oregano, 1/2 tsp cayenne and the juice of 2 fresh squeezed limes. By now the salt will have made the garlic very juicy. Mince it and add to the dressing. Mix well and pour over salad. Put a lid and shake to distribute the dressing throughout the salad. Now clean, strips the leaves and chop of 1/2 cup of fresh cilantro. The salad tastes good right away, but it’s heavenly the next day. This is subtly spicier than the Cuban salad, with a bright, fresh flavor that’s addictive. This makes way more than a single serving, but it keeps its flavor, freshness and texture well. It’s a real win at potlucks. A week ago, Sunday, I roasted a post-Thanksgiving turkey. New Seasons, the fabulous grocer nearest me, had deeply discounted their fresh turkeys hoping to sell them off before being forced to freeze them for less sumptuous turkey dinners of the future. In the past week I have had roast turkey, turkey sandwiches, turkey lavash rollups, turkey mushroom casserole, turkey salad and turkey dumpling soup and I still had a pound of bits and pieces. So, since I had already made everything else, I decided to make a chili. Or more honestly, a “chili”, the scare quotes indicating how very unorthodox and inauthentic my chili will be. I save my bacon fat in a little butter bowl, storing it for cooking when I want to add some easy flavor. I put two tablespoons in the bottom of my stock pot and began adding ingredients, stirring and sauteeing over medium heat. I let all this cook. Meanwhile I chopped up a bunch of kale. That turned out to be too much and I made yesterday’s salad with the unused kale. 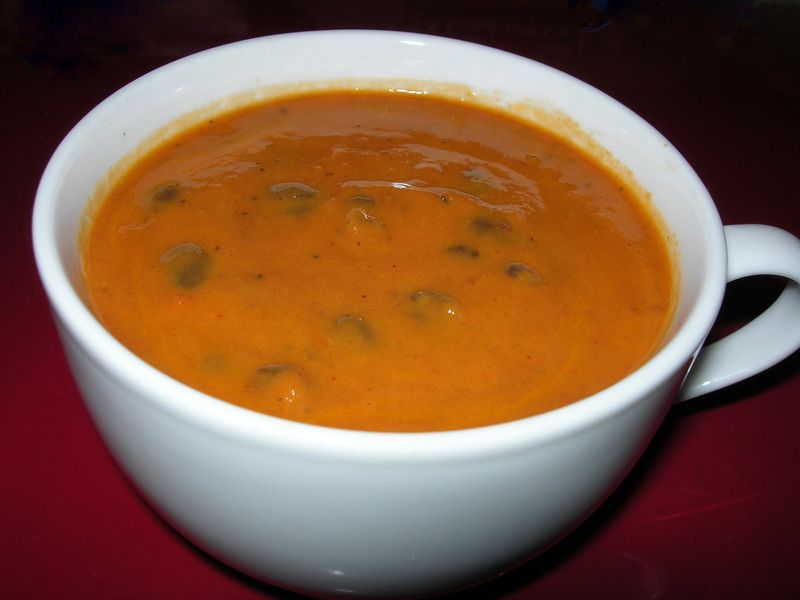 I added about 4 cups of chopped kate to the soup and put a lid on it and let it simmer. After it was done, I tasted and added a bit of salt and pepper to taste. Well, you can’t go wrong mixing tomatoes, black beans, corn and onions together – but the turkey adds a mellow savoriness and the kale gives it an earthy flavor. 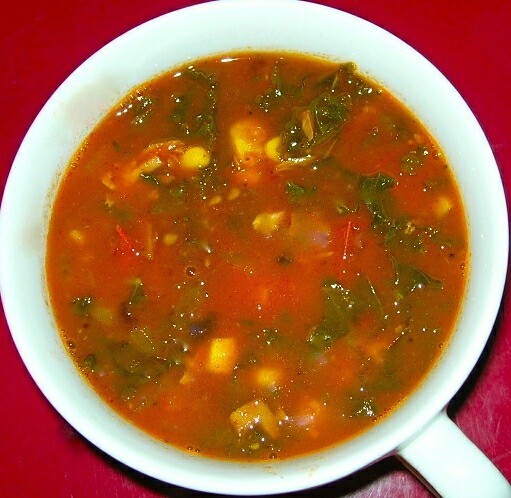 The overall taste is bright and fresh with plenty of toothsome bites with the black beans, the corn and the kale. This last catch-all dish is by no means a single serving, however. It made 2 quarts of soup for 8 servings. 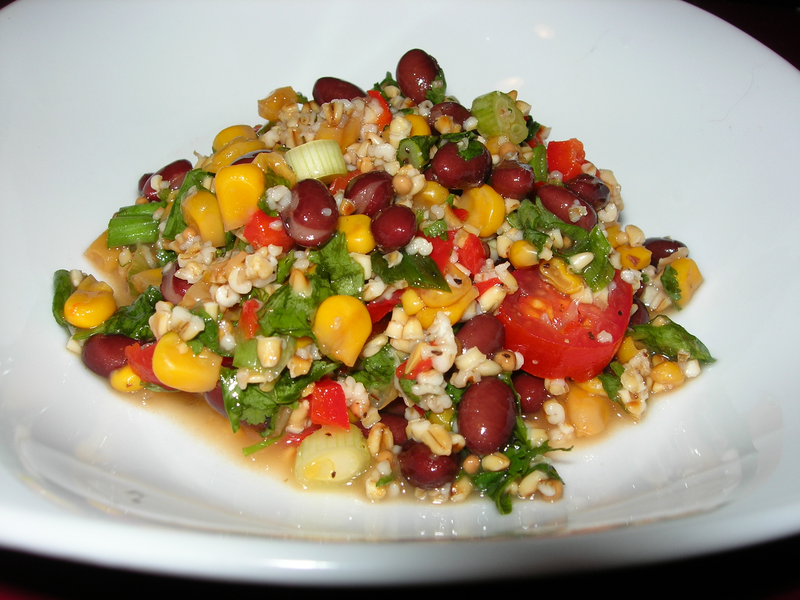 This is a slightly modified version of the vegan Cuban Bean Salad I make quite often. First I opened a can of black beans, kidney beans and chickpeas and rinsed and drained them. I then chopped up a yellow onion, two red peppers, three roma tomatoes, three stalks of celery, a bunch of cilantro and about 10 small baby dill pickles and mixed them altogether. In another bowl, I mixed a small can of diced jalapeños (I usually use 2 fresh ones but forgot to buy them when I went grocery shopping) with juice from 3 squeezed lemons, and 1/4 cup of olive oil, 2 tsp of cumin, 1 tsp of oregano and salt and pepper. I mixed all that together and dressed the salad and let marinate for a day before serving. For the sandwich, I heated 2 tsp of olive oil in a small saute pan. I cut off a 1/4 inch slice from a medium onion and chopped it fine and minced on small garlic clove and sauteed them until brown. I cut off 1/4 of a red pepper and 1/2 of a large crimini mushroom and chopped them up and added them and let them cook until nearly done. Then I added some cold chicken that I had reserved from making chicken soup, chopped into small pieces (about 4 oz) and about 2 oz of pepper jack cheese shredded up. I just heated them long enough for the cheese to melt. Meanwhile I toasted a ciabatta bun and spread it with a little sandwich spread I make ahead that is 2 parts mayo, 1 part, mustard and 1 part chopped dill with a dash of garlic powder, salt and pepper all mixed together. The sandwich was rich with a hearty umami flavor that was beautifully balanced with heat from the pepper jack and garlic. 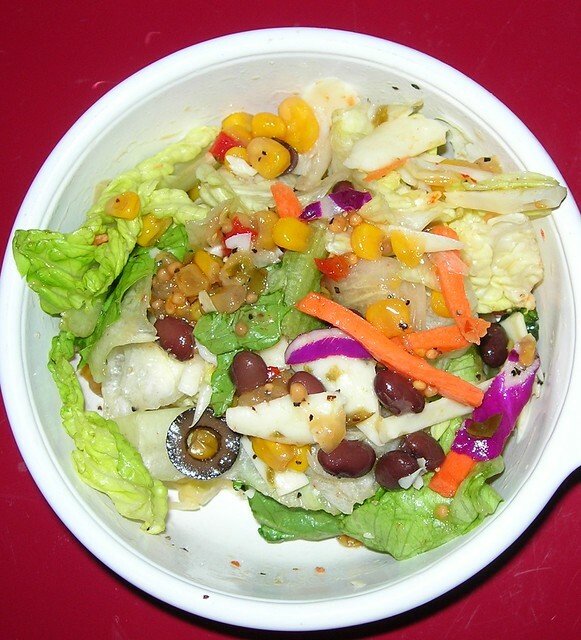 The salad is a luscious, fresh tasting mix of tart, spice and veggie freshness. Mix together and let sit overnight before serving. This makes a lot, but it keeps very well as it’s acidic and has no dairy or meat in it. The flavor is spicy and tart with the fresh taste of lemon giving it a lovely bite. 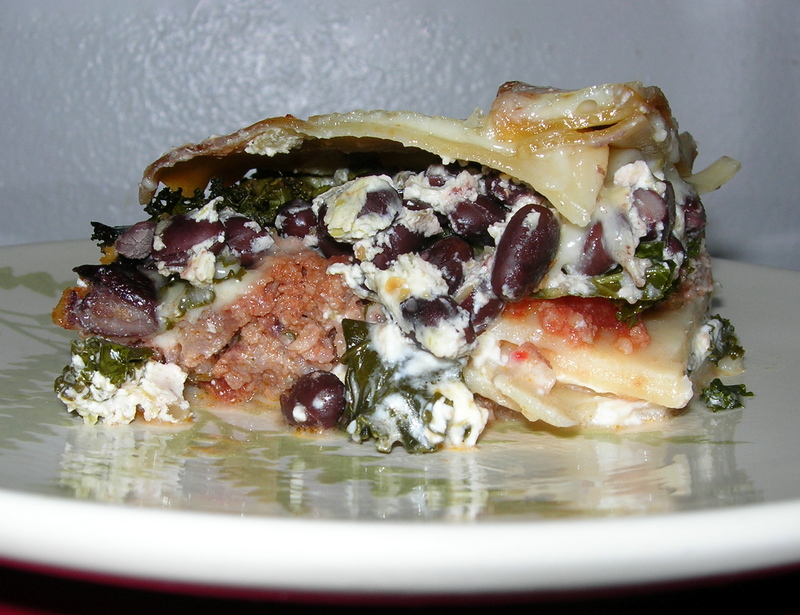 Believe it or not, this vegetarian black bean lasagna tastes better than a meat lasagna to this carnivore. It’s an amazing recipe and one that I don’t cook often, because it’s more work than I usually like to put into cooking a meal. However, for potlucks, parties and guests, it’s a perfect choice. People will be amazed. Drain the beans, reserving the liquid. Measure 2/3 cup of beans and reserve the rest for later. Roast the cumin and coriander in a dry skillet.Add cooked rice, stir in salt and pepper and let cool. Stir in corn, stock, peppers, chilis, cilantro and 2/3 cup black beans. Place 2 tablespoons of the vegetable stock in a saucepan. Add onion, garlic, cumin, coriander, chili powder, sherry and sherry vinegar. Simmer 3 minutes. Add tomato paste, reserved beans and its liquid. Cook additional 8 minutes. Process until nearly smooth, leaving some bits of beans intact. Add remaining vegetable stock and cilantro. Reserve. Spread 2/3 cup of the marinara sauce in the bottom of a 9*13 backing dish. 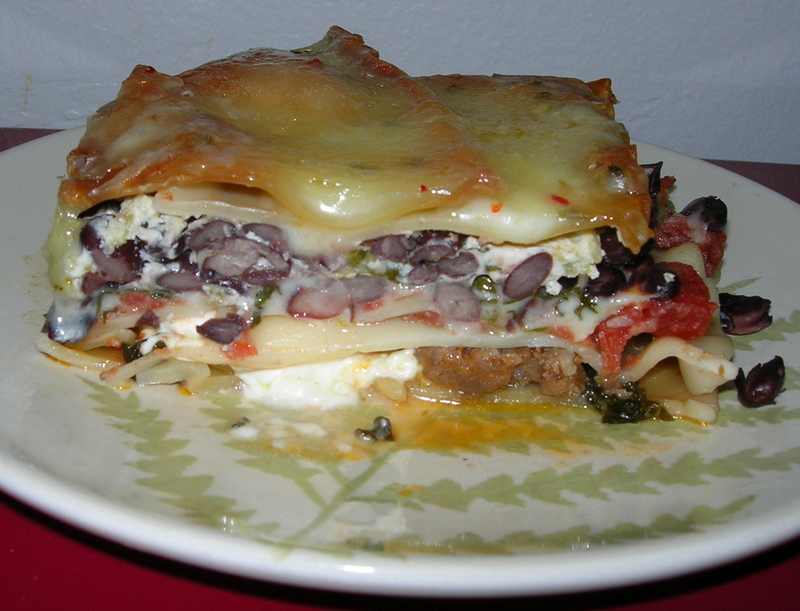 Cover with one layer of cooked lasagna noodles. Spoon on half of the rice mixture and 3/4 cup of the bean sauce. Top with 1/2 cup of the ricotta cheese and 1 1/4 cup of the mozzarella. If you want, add more ricotta and use the whole container. 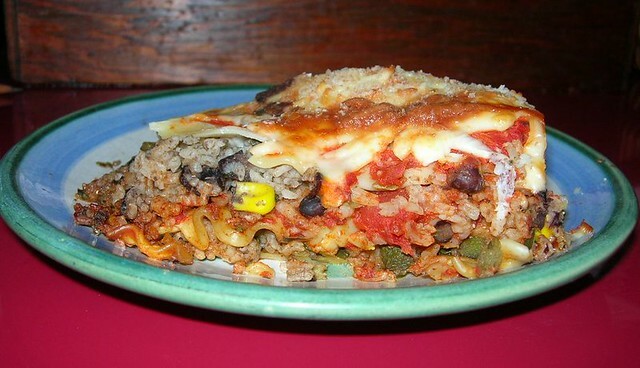 Cover with another layer of lasagna noodles and 1 cup marinara sauce. Repeat the layering of rice and cheese. Top with the last layer of noodles. Press lightly to distribute evenly..
Add last layer of marinara (3rd). Sprinkle the remaining mozzarella and bread crumbs. Preheat oven to 400 degrees. Bake for 35 minutes. Let stand about 20 minutes before cutting.